You’ve managed to stash some emergency funds, but the rates your local bank is paying aren’t great – get a high interest savings account! Saving cash in an emergency fund is often recommended by financial experts. I’ve found that having cash in a local bank or just a click away at an online bank gives me a lot of mental security. I know that if there’s an emergency where a paycheck doesn’t get deposited on time or there’s an unexpected job loss, there is easy to access cash to pay the bills for an extended period of time. I know I won’t have to liquidate retirement accounts or sell a car to pay the mortgage. Having a cash emergency fund gives me a lot of peace of mind. You can use one to save for college expenses, a car, or anything. Banks make money when they can loan your savings out to others – but some banks pay more than others when it comes to savings. Typical savings accounts pay abysmal returns. Nationally, brick and mortar banks pay an average of about 0.07% annual percentage yield (APY). 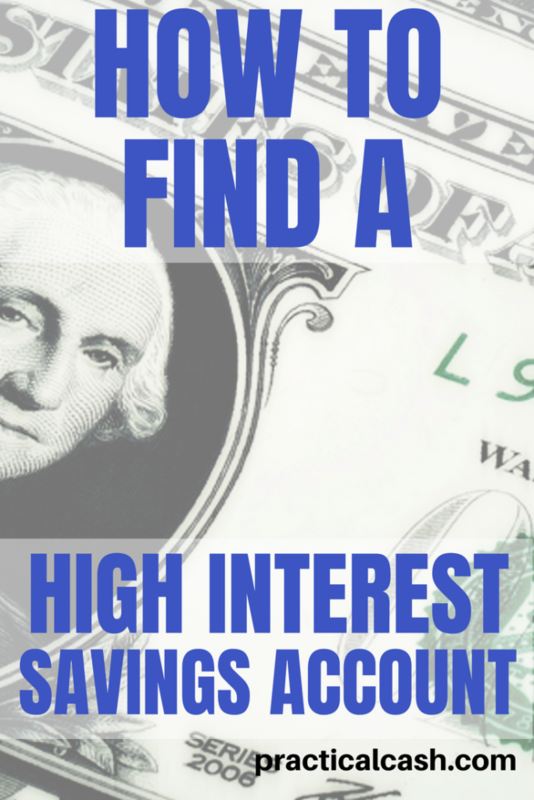 Why Should I Use a High Interest Savings Account? I love my current bank – they have a lot of tech features that make it easy to deposit checks, withdraw cash, and manage my account. And if I need to go into a branch, there are lots of local options and the cashiers and managers are friendly and helpful. But although I use a local bank for my checking account, no way would I keep my savings at my local bank. Their interest rates are just not competitive. As an example, my bank is paying 0.01% annual percentage yield interest on amounts between $1.00 and $100,000. If, for example, I have $50,000 in my account that the bank can lend out to others, they’ll only pay me $5.00 per year for the privilege. Some people feel more comfortable with keeping their emergency cash at a local bank. Personally, I’m fine with the few business days it takes to move cash from a high interest savings account to my checking account because the higher interest payment is worth it. For many online banks, you won’t be able to write checks or use an ATM card and you may only be able to access your funds by transferring them to an outside checking account. 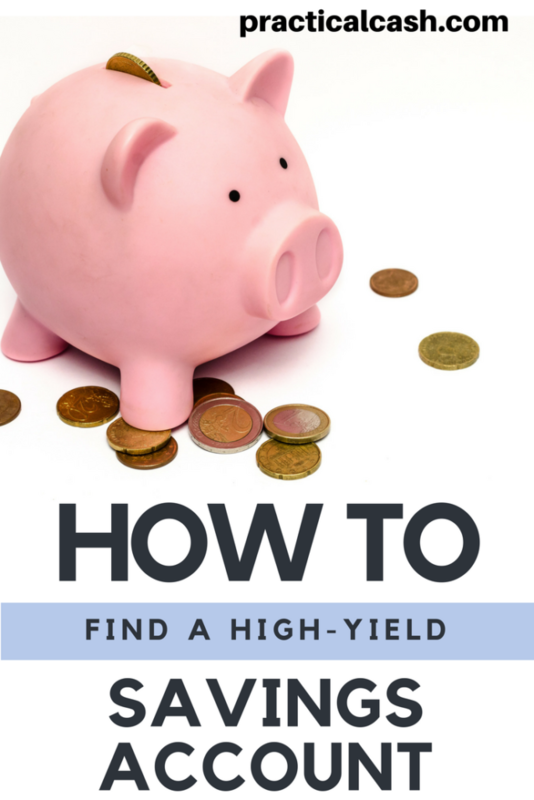 If that’s an important consideration for you, be sure to check that the high yield interest savings you’re choosing has ATM access. Even if you keep some savings with a local bank, it’s pretty easy to keep track of all of your accounts with Personal Capital. Personal Capital is free, takes only about 30 minutes to set up, and allows you to easily track your income, expenses, and net worth online. You simply enter your bank account and credit card info one time, and then the online app updates your debt and income automatically. It also offers super cool graphics and charts to help you manage your money. Click here to check out Personal Capital for yourself. Note: The interest rates these banks are paying is as of the time of this writing. Please search for “[bank name]” + “savings interest rate” to get up-to-date rates. Currently, Ally Bank offers a high interest savings account paying 2.00% annual percentage yield (APY). Ally is strictly an online bank with no physical locations, so their overhead costs are lower. They don’t have a minimum balance and they don’t have maintenance fees. Also, Ally is well known for having a fantastic digital experience with an easy-to-use website and mobile app. Alliant is an online credit union currently paying 2.00% APY. With no monthly fee, just an initial $5 deposit, and a robust online and mobile banking capability, Alliant is a competitive savings option. American Express Personal Savings offers a 2.1% high yield savings account with no monthly fees or minimum balances. If you’re already an American Express credit card user, this high interest savings might be for you. Barclays boasts an impressive 2.2% APY on its high-yield savings account and has no minimum balance or monthly fee. However, the tech nerds may want to consider that Barclays lacks a mobile app and customer service is only available by phone, not online. You can access your account through a website interface, though. Have you heard of Live Oak Bank? I found they’re paying one of the highest of any online savings we’ve found – 2.25% APY on their high yield savings, which is about 25x the national average for banks. They have no monthly maintenance fees and minimum balance fees. You can easily transfer money to your Live Oak account via an ACH transaction or even mail a check to start earning more interest! Marcus beats Chase, Citibank, Wells Fargo, and Bank of America savings account rates with its 2.25% APY. You only have to have $1 in your account to earn these rates, and there are no transaction fees associated with their high interest checking. Another option for earning more on your emergency fund stash. A money market is a little different than a savings account. Both accounts are secure, are insured by the Federal Deposit Insurance Corporation (FDIC), and earn interest. But with a money market account, you can write checks and use debit cards. With a savings account, you might not have that ability. Capital 360 savings accounts offer a 1.00% interest rate, which is a lot better than the rates of my local bank, mentioned earlier. But their 360 Money Market account offers 2.00% APY. Capital One is very easy to use, with a snappy online interface and mobile app and no monthly fees. But to earn the 2.00% APY, you do have to keep a balance above $10,000. Do you keep your emergency fund in a high yield savings account or with a local bank? Why did you make that choice?